Stand Up Paddleboard lessons in Newquay for school groups. Mix a lesson in history, heritage and marine wildlife with a buzz inducing adventure that students will never forget. 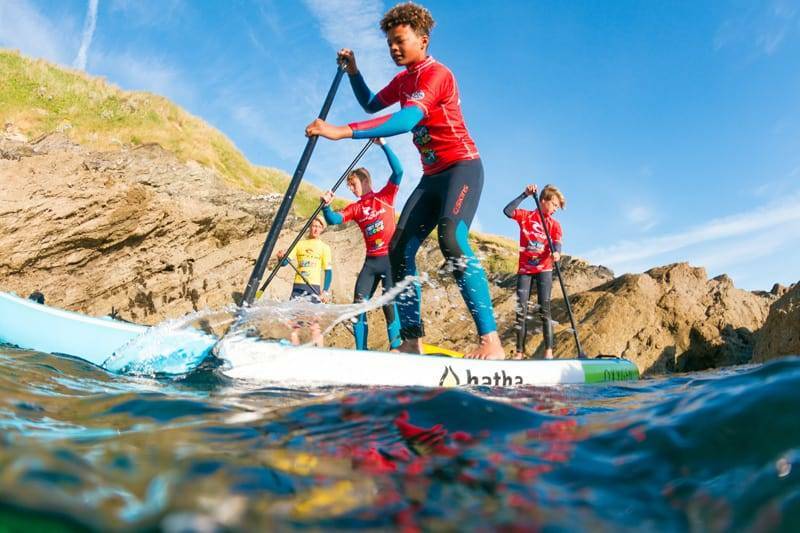 Our stand up paddle boarding (SUP) lessons for schools explore Newquay’s stunning coastline and master the basics of this must-try watersport in just one session. After a full safety briefing and equipped with the basic skills of balancing, paddling and manoeuvring, it’s time for wildlife watching games, fun explorations and a coastal tour brimming with local info. We’ll launch our stand up paddle boards from the sheltered sands of Towan Beach and head out around the coastline paddling into caves and caverns that once played host to real pirates and smugglers. Sharing stories of Newquay’s dramatic past as we go, history will come bursting to life. We’ll also keep an eye out for wildlife and students may even be treated to a close up view of inquisitive seals and local dolphins! All our school trip activities can be tailored to feature key curriculum topics and learning goals. From science, maths, English language and literature to personal development, social skills, self-confidence and physical development, we specialise in helping pupils to harness every drop of learning potential that our amazing outdoor classroom offers. Each child needs to bring a completed medical declaration and consent form, please note those without will be unable to attend. Under the guidance and tuition of some of the most qualified, experienced and insured instructors in the country, adventures with Newquay Activity Centre are all about practical learning and exploring our coastlines up close. With us, students are encouraged to push their boundaries whilst safe in a supportive environment. Your pupils couldn’t be in more experienced or safer hands when stand up paddle boarding in Newquay. Here at the Newquay Activity Centre Cornwall we take safety seriously. We’re a certified ISA and Surfing England Centre of Excellence and two times winner of the Cornwall Tourism Awards. We ensure the highest standards of adventure leadership and outdoor safety for all ages and abilities. Our SUP sessions in Newquay are arranged to suit your group size and budget or can form part of a full week of activities. Simply give us a call and our experienced bookings team will build the perfect outdoor education package for your school group. So drop us a line or give our team a call and we’ll sort you out with the best activity for you, proper job! Call 01637 877722, lines open from 8am-10pm.